Piezoelectric energy harvesters have many applications, including sensor nodes, wireless communication, microelectromechanical systems, handheld devices, and mobile devices. 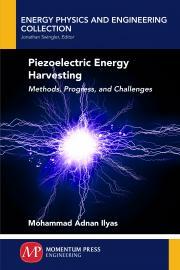 The book also presents a new approach within piezoelectric energy harvesting using the impact of raindrops. The energyharvesting model presented is further analyzed for single-unit harvester and an array of multiple harvesters to maximize the efficiency of the device. Mohammad Adnan Ilyas received a bachelor of engineering (Hon) in electrical and electronic engineering from Heriot- Watt University, UK, in 2012 followed by an MSc in renewable energy and distributed generation in 2013. Currently Adnan is pursuing his research in energy harvesting with a focus on piezoelectrical harvesters to obtain a PhD in electrical engineering at Heriot- Watt University, UK.